Wild Thing Cafe | Mmm, Tasty! Another cafe has opened up in the Annex. I know, I know, we probably don’t need another cafe in the Annex, right? But this one is doing things a little differently, and I think they can make it work. Honestly, I would have walked by this Borden Street cafe without giving it much of a second glance. From the outside it seems pretty unremarkable, with it’s retro ‘Manny’s Coffee Shop’ Pepsi sign, left over from the previous business. Once inside, however, you’re greeted with a cute cafe with comfortable seating and a good menu. The coffee menu contains all the usual suspects: cappuccino, latte, espresso, mochas, and various iced drinks. I ordered a macchiato and Rich ordered a cappuccino. I was very pleased to find the owner asking how I wanted my macchiato: with just a hint of foam, or more milky. Asking for just a hint of foam turned up exactly what I would expect in a good macchiato: nice espresso, good crema, and a hint of foam. Delicious. 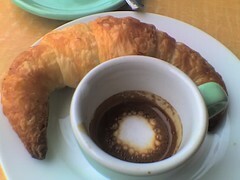 My croissant was nothing special, but it was buttery and got my pastry craving under control. 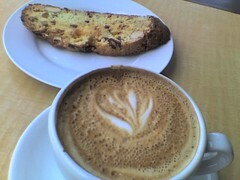 Rich’s biscotti was good, full of fruit and nuts. Wild Thing is also offering homemade gelato, in a variety of interesting flavours such as pineapple and basil, mayan chocolate, and vodka and grapefruit. They also offer gelato with espresso, an Italian dessert known as an affogato. Lunches here also look promising: a panini served with a side salad for $6.50. I’ll be back to try one of those soon. Has anyone else been here? What did you think?